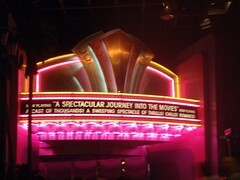 The Great Movie Ride is a fun ride through various movie scenes. The line queue is fun with you going by some props from movies including a carousel horse from Mary Poppins. It is a nice long ride and a good way to escape the hot humid Orlando weather for a little bit. 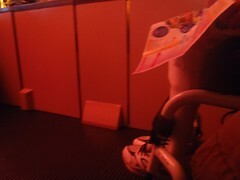 All the vehicles for the Great Movie Ride have room for wheelchairs in the back. This area has wide open area to the right of two benches and probably could fit two wheelchairs with the group being able to sit right next to them.